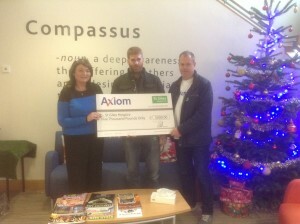 Instead of sending company cards this Christmas, Axiom GB has entered into the festive spirit by making a donation of £5,000 to St Giles Hospice in Tamworth. St Giles Hospice is a registered charity offering high-quality specialist care free of charge for people living with cancer and other serious illnesses, as well as providing support for their families and carers. Care is offered at the hospice’s centres in Whittington, Sutton Coldfield, Walsall and Uttoxeter, or in patients’ own homes across the region. Picture caption: The Axiom GB directors, Andrew and Matthew Nickson, presenting the donation to Natalie Ellis, corporate and community fundraiser for St Giles Hospice.